The Lear Center acted as a special consultant to the Declaration of Independence Road Trip, an independent organization founded by Norman Lear in 2000. Lear Center staff were centrally involved in the production of editorial content for the multimedia exhibition, its print materials, its Web site, its educational curriculum, and its civic engagement activities. The Declaration of Independence Road Trip was a nonprofit, nonpartisan project that took an original copy of the Declaration of Independence on a three-and-a-half year cross-country tour. The goal of the project was to bring the “People’s Document” directly to all Americans – especially young people – to inspire them to see citizenship as an opportunity to participate in civic life; to exercise their rights; and above all, to vote. As the Road Trip traveled to cities and towns across the United States, it creatively combined elements of education, entertainment, and community outreach. A Philadelphia man bought a painting for four dollars at a flea market in 1989. When investigating a tear in the painting, he found what he thought was a reproduction of the Declaration. A friend later persuaded him to have Sotheby’s evaluate it, and they declared it one of the original Dunlap broadside copies of the Declaration of Independence. When TV producer and philanthropist Norman Lear learned that the Dunlap broadside would be auctioned, he saw it as a once-in-a-lifetime opportunity to bring it to the American people. Lear purchased it and development of the project now known as the Declaration of Independence Road Trip began. Former United States Presidents Gerald R. Ford and Jimmy Carter served as honorary co-chairs of the project and The Home Depot was the proud sponsor. 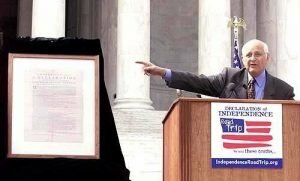 The Road Trip launched during two days of events on July 3, 2001 at a press conference at the Jefferson Memorial in Washington, D.C., and on July 4, 2001, the 225th anniversary of the adoption of the Declaration of Independence by the Continental Congress. 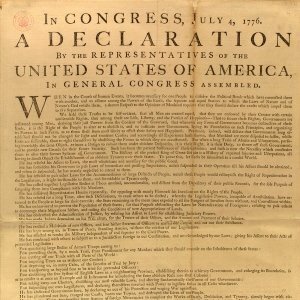 The centerpiece of the Philadelphia event, held in conjunction with the City of Philadelphia’s Fourth of July celebrations, was an unprecedented live dramatic reading of the Declaration featuring distinguished actors, including Mel Gibson, Morgan Freeman, Kathy Bates, Michael Douglas, Whoopi Goldberg, and Kevin Spacey. This performance was the centerpiece of a live national ABC special on July 4th. 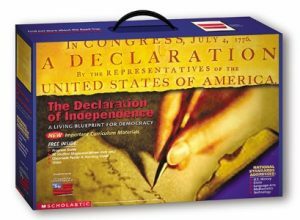 From appearances at the 2002 Winter Olympic Games and Cultural Olympiad in Salt Lake City, to the 2002 Super Bowl in Atlanta, the Declaration of Independence Road Trip has made its way to communities and cities across the United States. The document toured the country extensively in conjunction with the 2004 and 2008 presidential elections. In November 2003, Norman Lear launched Declare Yourself, a national nonpartisan, nonprofit campaign to energize and empower a new movement of young voters to participate in the 2004 presidential election. The DY Campaign is the culmination of the Declaration of Independence Road Trip project. Read the Princeton Survey Research Associates’ evaluation of the effectiveness of DY in 2004. Remix America, a nonpartisan, nonprofit in-browser editing tool that allowed citizens around the country to remix the great words and speeches of American History with the hot button issues of the day. Born-Again American, a virally distributed movie, song and citizen pledge. The Lear Center has contributed to all of these initiatives.